Looking for a new type of adrenaline rush? Why not take-off in a self-launching Hang Glider? 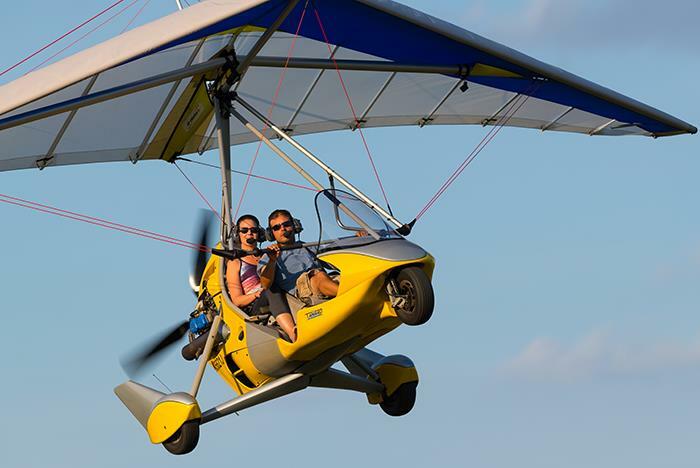 Operated by Hang Glide Orlando, these tandem hang gliding flights will provide you with a thrilling experience and an unbeatable view of Central Florida. This interactive opportunity also provides passengers with hands-on experiences meaning you can learn to soar, with the help of your instructor, of course! Flight times vary based on flight type chosen. Guests cannot exceed 240 lbs. Passengers must be at least 18 years old. Wear warm clothing and closed-toe shoes due to the altitude. The flights carry one passenger and one instructor at a time. Experience the thrill and freedom of soaring flight in a self-launching Hang Glider! During your flight with an FAA-certified instructor, you will feel confident and relaxed with the wind in your face while climbing high into the air. 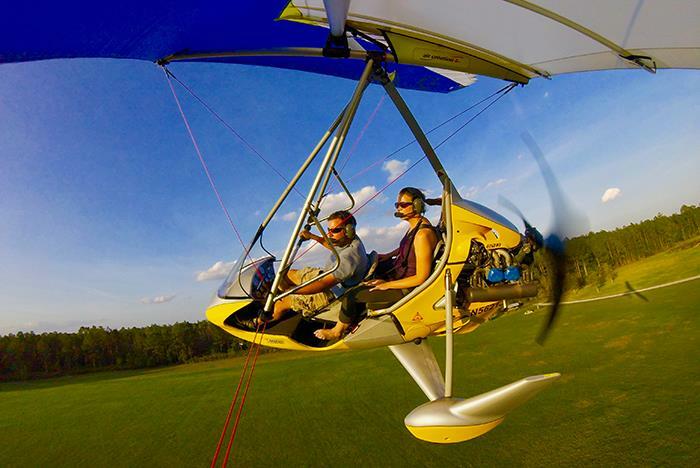 Once at altitude enjoying a bird's eye view of Central Florida, the instructor will turn off the engine to experience free flight as you gently glide and safely maneuver back to earth with a smooth rolling landing. You will never forget this amazing experience! 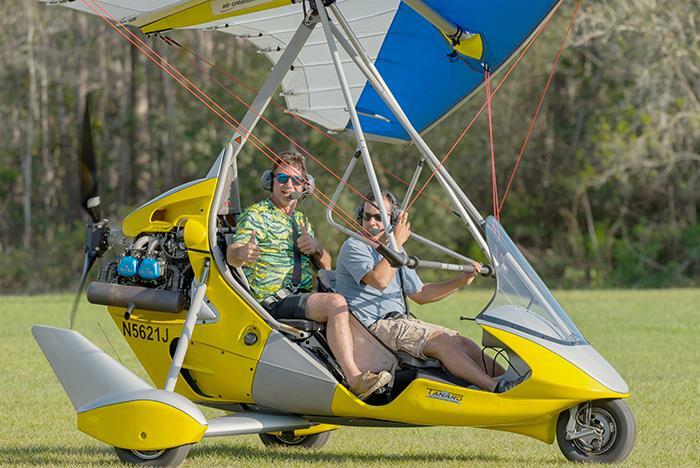 Flights with Hang Glide Orlando are exciting & interactive ‘hands-on’ experiences! Once aloft, your instructor will show you the basics of hang gliding and you can try your hand at soaring. Not sure if you are ready to take the wheel? That’s okay! Just sit back and enjoy your flight. All Flights: Max weight limit 240 lbs. and minimum age 18. Flight altitudes also range by flight type. Yes. You must be at least 18 years old in order to fly. Yes. You must weigh under 240 lbs. to fly. Because of the altitudes you will be flying at, it is recommended that you wear close-toed shoes and socks. Long pants and a light jacket or sweatshirt are advised if you get cold easily. We fly anytime the weather allows us to fly. The best conditions for flying are in smooth air and calm winds, generally in the early morning or late in the afternoon. What is a self-launching hang glider? Also called a ‘trike’, it is an FAA-certified Light Sport Aircraft that features a hang gliding wing and weight shift operation. It flies much like a traditional hang glider, but is powered by a reliable aircraft engine. 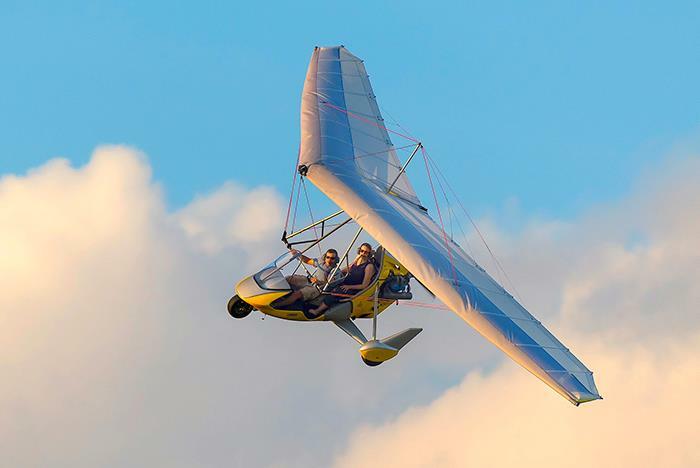 Trikes provide the experience of traditional hang gliding, but are more capable of flying safely in a wider range of weather conditions. Trikes also have other advantages in comfort (big, cushy seats) and safety (BMW-engineered steel safety cage), and they enable longer airtime. How safe is powered hang gliding? We have a 100% safety record and our trikes are incredibly strong. For your safety and peace of mind, our trikes are furthermore outfitted with a ballistic parachute system. But most importantly, we simply don’t fly in marginal conditions. After all, it’s all about having fun! What happens if the engine quits? A trike is a powered hang glider, designed for flight with or without power. At Hang Glide Orlando, the engine is only used to climb to altitude. Then we turn off the engine and silently glide back down to earth. The engine is a Rotax 912, 4 stroke engine with silencer kit designed for noise reduction. In addition to the sound reduction features, you will also be wearing an intercom headset which not only allows you clear in-flight communication but also reduces outside sound.